Camel cup, or as I lovingly dubbed it ‘T.A.B. Junior’ is a desert based board game with a suggested age of 8 and up. 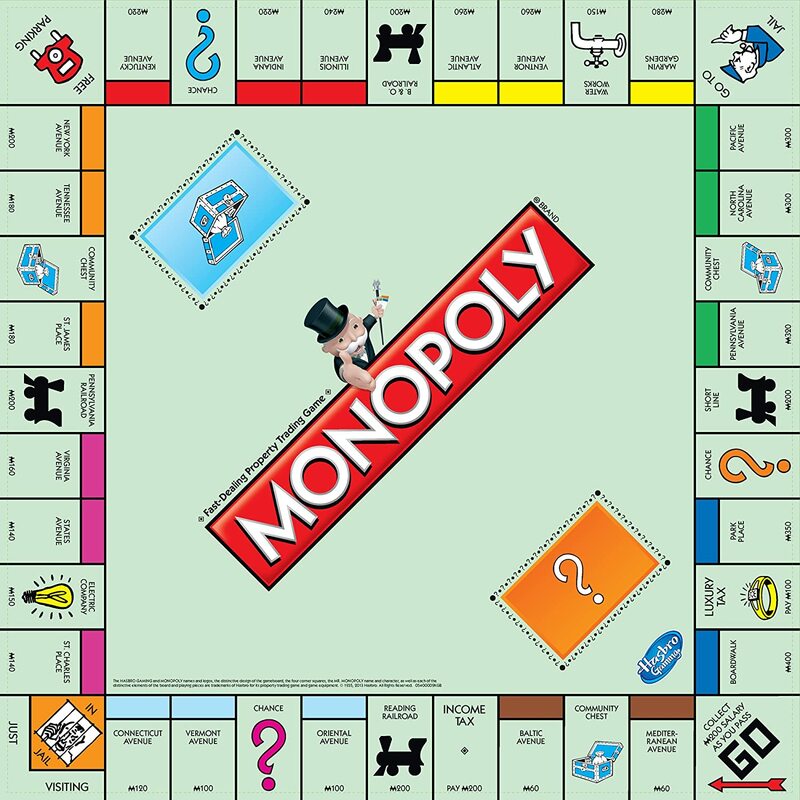 Due to my lack of board game expertise the aural description of the rules did not explain the mechanics of the game clearly enough for me to understand. It was not until we started playing the game when the simplicity of the rules and mechanics were explained. The game itself is not overly complicated; the winner is a combination of mostly good luck and some picking the right point to bet. The physical components are both visually and tactically pleasing, with child friendly images and mechanics (such as the constructed pyramid as the dice roller), and the layout of the racetrack and “tents”, this adds a child friendly aspect to a game which at first glance may seem overly complicated for younger audiences. 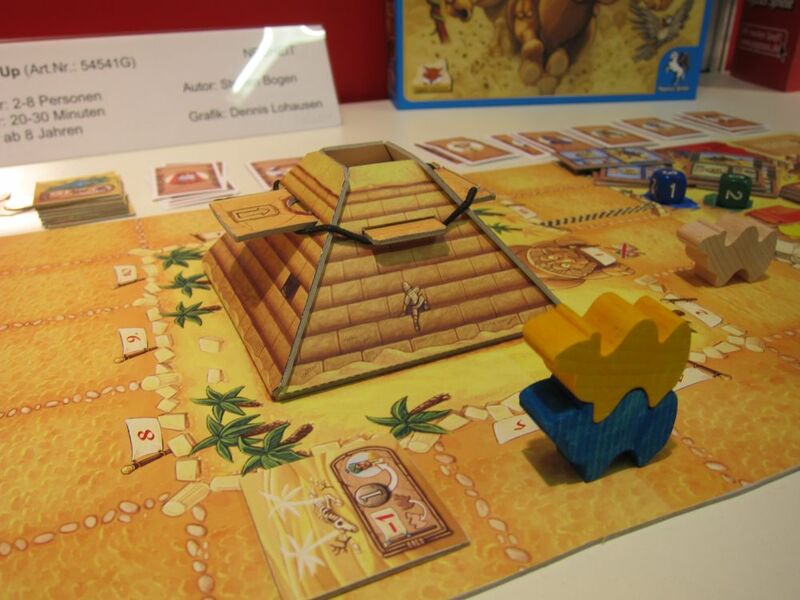 The game board with a two stack Camel Up and the Pyramid Dice roller. 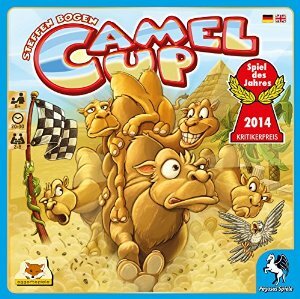 Camel cup has several game mechanics that separate it from ordinary ‘round the board’ games. Particularly the camels themselves stacking add an exciting element to the game based purely on probability, however one disadvantageous roll may result in the camel which appears to have the lead falling into last place. The same can happen with last place rolling well and becoming first place. If a there was a 3 stack high “Camel Up” and the bottom camel rolled, all three camels are to move with the bottom camel, remaining in order when lading on the new square. The game does not count out the camels behind. 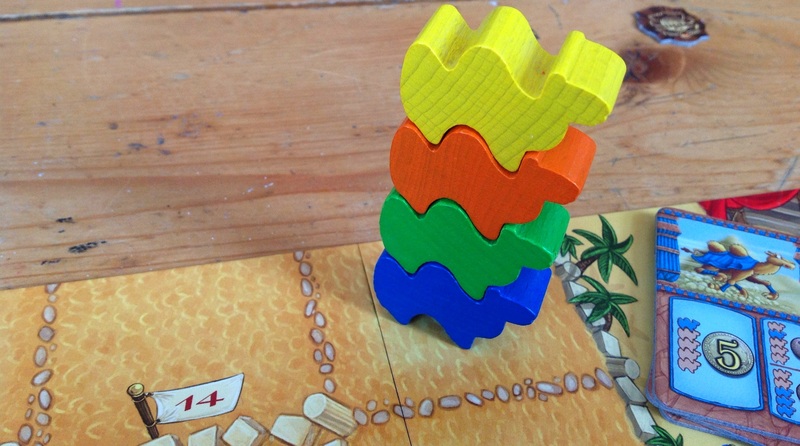 A mighty four stack Camel Up! The race itself does not determine the victor, rather the winner is the player at the end, who by combination; betted best, chose the winning camel early and chose the losing camel early. The game encourages the recognition of logical probability. Overall the game has a simplistic gambling system whilst maintaining interesting board mechanics. For this reason the game is fun to play however, the simplistic nature deteriorates the replay value amongst older audiences. Overall I give Camel Cup 7 out of 10 stacked camels. ← The internet of Things.